Some days I have no idea what to write. This is one of those days. So I thought I’d provide some thoughts that have been circulating around my brain for the past several days. They are in no particular order and are of no particular importance. They are just thoughts that relate to evaluation. Recently, I had the opportunity to attend a professional development session on qualitative data with Johnny Saldana. Other than there wasn’t enough time to thoroughly cover the topic (it was the structure of the conference), I was once again impressed with the complexity of the topic. Although it was titled “Advanced Qualitative Inquiry”, I thought a participant would need to know something about coding qualitative data in order to understand the this complexity. Saldana did a masterful job–which is something given that he comes from a discipline so very different from evaluation (although some people draw a parallel between his discipline–theater–and evaluation; both being an interpretive disciplines). 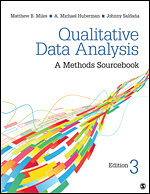 I’ve mentioned Saldana before–he was commissioned by SAGE to write the third edition of the Miles and Huberman classic, Qualitative Data Analysis. The third edition was published in April, 2013.. 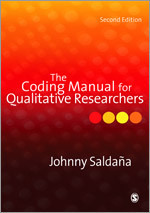 Some of what Saldana shared with us in the session was from his book, Coding Manual for Qualitative Researchers. I have that book and have started reading it. I’ll be submitting a review of it and the Qualitative Data Analysis to American Journal of Evaluation this fall. I haven’t gotten anything written on the four manuscripts I thought I’d be able to finish this summer. I’ve about six weeks left (classes at OSU don’t start until the middle of September). So much else has happened: I’ve been asked to develop a chapter for a New Directions in Evaluation volume on Needs Assessment in the public sector; to co-lead a professional development session on Needs Assessment and Assets; and to review a manuscript on qualitative evaluation using a logic mode in addition to developing the evaluation I mentioned a while back. This experience reinforces truly the need to block time for writing and to protect it. I block time; I don’t tend to protect it. Lesson learned. Surveys were another question that was posed to me–odd or even scales on the survey. The answer there is, “It all depends.” The “all depends” relates to many variables including cost and time and other resources. The Kirkpatricks talk about aspects of evaluation in their blog this week. They include a webinar of what to do when resources are scarce.